Chalet Panda is one of our larger chalet apartments within the de l’Ours residence, comfortably accommodating 14 guests and one of only two of our apartments with two separate floors. Every one of the seven bedrooms has a balcony to make the most of the views across resort or down the valley. This apartment chalet is perfect for a large group of friends or several families and has the added bonus of its own private sauna on the lower floor. All guests also have free use of the indoor swimming-pool in the adjacent Altitude Residence. Satellite TV, free Wifi and hairdryers in every room come as standard in all our apartment chalets here. Evening meals will be on 6 nights. On your Host’s day off, they will leave a simpler continental breakfast out for you to help yourselves, there is no afternoon tea on these days, and you can dine out locally in the evening. Your Resort Representative will gladly help out with information and make a reservation for you if you wish. Our transfers from our home to Chalet Panda and back again via Gatwick and Geneva went very smoothly. This was probably helped by having a Sunday transfer day. Chalet Panda was reasonably conveniently located being about 200 yards from the nearest lift and extremely cosy with very friendly and helpful staff, namely the chalet boys - Duncan and Matt. The Arc 2000 resort manager was also very helpful. The food was great with plenty of reasonable wine with every evening meal. Our only complaint was that the bread was never fresh, and always too dry. In addition to having easy access to the slopes, Chalet Panda was even colder to our evening entertainment in the nearby pub, with a large screen showing major sports and regular quiz nights. I have never skied this late in the season before (the end of March), but there was no choice this year, as my son had started uni and was no longer free at half term. 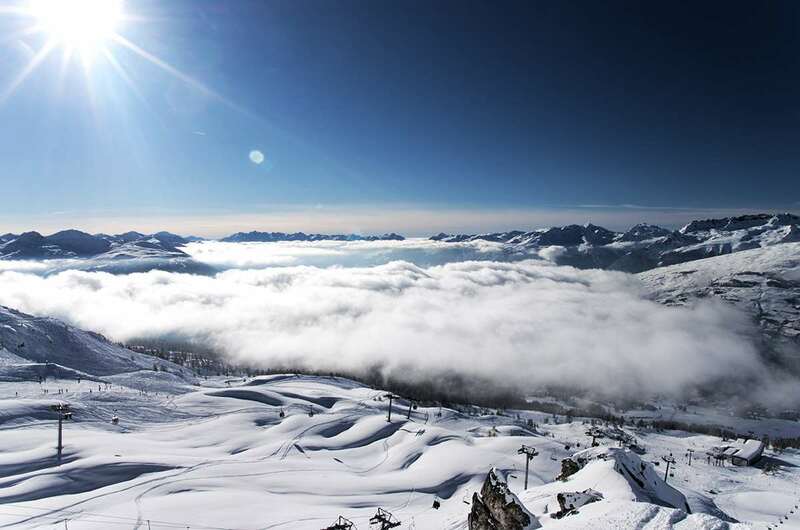 I have been to Les Arcs before and enjoyed the wide variety of snow and pistes and given the altitude I figured that we should still be sure of some good snow. As it turned out, we did, but we would have been less happy at any lower lying resort. It snowed at the start of the week and this gave a very welcome top-up the resort at 2000m and upwards, but only a short lived reprive for the lower slopes. We managed a trip to La Plagne, but the conditions were better on the Arcs side of the Vanoise Express. As the week progressed, it got sunnier and warmer and we had to set out both earlier and higher for the best conditions. Matt and Duncan at the Chalet Panda provided an excellent selection of meals and cakes which were very welcome when we returned to the chalet in the afternoon. This is not exactly the kind of ski-in/out accomodation, that you can often find in France, but it had a range of facilities close-by and was very reasonably priced.